If you're planning to come to Scotland on a salmon fishing trip and don't fully understand Scottish salmon fishing tactics or have the correct salmon fishing equipment levels it is best to book a professional guide to set you off on the right footing. A reputable professional Scottish fishing guide will have developed a 'sixth sense' of where salmon can be found on a salmon beat regardless of the prevailing water conditions. He will also be operating on a totally different thought frequency from the majority of salmon fishers and often the notions he'll act upon will result in the capture of a fish. A Scottish guide who is on 'top of his game' will fully understand the moods of the river and exactly when a bigger effort throughout the course of the fishing day should be made. 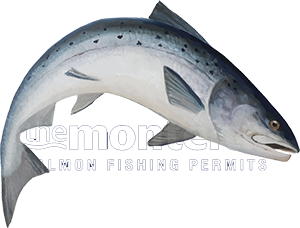 This additional skill set increases your chances of salmon fishing success ten fold and a professional guide's intuition can only be learned from years of daily riverbank experience of which there is no substitute for. Take the guesswork out of how to approach the Scottish salmon beats and engage the services of a salmon guide to shadow your approach and make sure your chances of success are soaring high at all times. Having watched new salmon anglers not capitalising on salmon hooking opportunities through one reason or another I cannot stress the importance of acquiring the correct professional assistance & tuition while fishing the Scottish salmon rivers. Hiring a personal guide is the most effective way to achieve this valuable salmon fishing tuition. All fully serviced Scottish salmon fishing venues will have a professional beat ghillie present but these men aren't often able to dedicate themselves to an individual guest(s) for the entire fishing day due to their other salmon beat operational & guest commitments so please do not misunderstand what the salmon beat ghillie's role is compared to that of a personal guide as these 2 roles are different. Follow this link for a detailed breakdown of the main roles of a salmon beat ghillie and personal salmon guide. A personal Scottish salmon guide should always be a consideration for at least the first day or two of your fishing trip if you're new to Scottish salmon fishing. Follow this link for detailed information on how to book a Scottish salmon fishing guide on Scotland's big four salmon rivers Tay, Dee, Tweed & Spey.